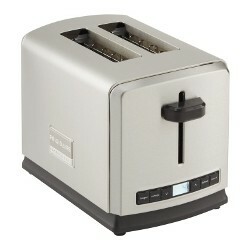 The toaster is another kitchen appliance that needs no introduction. And while the process to make toast between different toasters remains largely the same, the sheer amount of toasters available on the market can make anyone’s head spin. 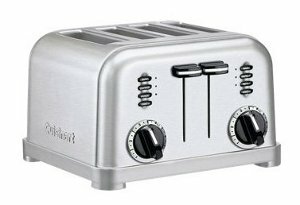 To expedite your search, we’ve compiled a list of top-performing toasters so that you can have that perfect slice of toast for breakfast. As its name implies, a toaster is used to toast bread. In a past article, we’ve already covered toaster ovens, and while there are still other kinds of toasters, in this article we’ll be going over the type that everyone is familiar with: pop-up toasters. Pop-up toasters work by having slices of bread placed vertically into slots; a lever brings the toast down and puts it into contact with the heating elements on both sides. Highly recommended by Consumer Reports, the Calphalon HE200ST 2 Slot toaster is relatively inexpensive machine that consistently churns out evenly browned toast time and again. Extra-wide slots can accommodate thickly-sliced bread, bagels, and English muffins. Aside from finely-tuned temperature controls, this toaster also has a defrost feature for items like frozen waffles. Users laud this Calphalon for its performance as well as for its slick, stainless steel finish. Currently $59.95 on Amazon. 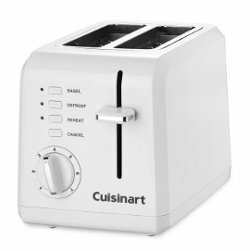 The Cuisinart CPT-122 is perfect for those looking for an inexpensive, well-performing toaster with few bells and whistles. While the white plastic may not carry that sleek, modern aesthetic, it covers all the functions and does so admirably. Wide slots allow you to fit in bagels, and dedicated bagel and defrost controls give you the versatility of heating most of your bread staples. Additionally, users claim it’s easy to clean and maintain, with a slide-out crumb tray to help you clean out pesky breadcrumbs. Currently $29.95 on Amazon. Well-reviewed by both Consumer Reports and Good Housekeeping, professional tests have proved that the Frigidaire Professional 2-Slice toaster consistently toasts bread evenly as well as quickly. It includes all the features you would expect in a toaster of this caliber — wide slots, multiple settings (bagel, defrost, and reheat), and a digital display that counts down to when your toast is finished. Currently $59.80 on Amazon. For those looking for greater cooking capacity, a four-slice toaster would better suit their needs than a two-slice toaster. 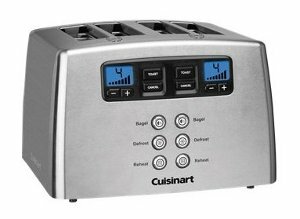 With everything you need for making not just toast but bagels and waffles, the Cuisinart 4-Slice Metal Classic also comes with defrost and reheating functions. 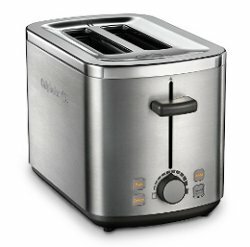 Most users applaud the performance and design of this toaster, although some mention that it doesn’t always toast evenly. Currently $59.98 on Amazon. One of the top four-slice toasters on Consumer Reports, the Cuisinart Touch to Toast comes with a number of extra features that make it the priciest toaster on this list. Users like the fact that the toaster can be activated by the push of a button, because it removes the mechanical lever which can occasionally fall apart. Aside from the other features common to all toasters on this list (wide slots and functions for bagels, defrost, and reheating) this toaster also comes with a backlit LCD display. Currently $99.95 on Amazon. These are our choices for the five best toasters. Make sure to head on over to Wise Bread’s Shopping Calendar in order to figure out when and how to buy just about anything!